As this week went on we ate a lot more of the same. Oatmeal, leftover soups and braised vegetables. We had a minor set back on Friday when I pulled the much anticipated sardines out of the freezer and after they had some time to defrost realized that they had gone bad, I think they had been previously frozen. So there went our protein for one night, I threw together something by shredding up the last of the chicken and it was ok, but far from great. Here's the rest of our week, you'll probably yawn at this because it looks a lot like the beginning of our week! 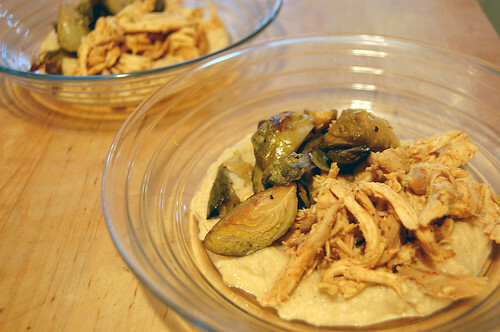 Roasted cauliflower puree with brussel sprouts and shredded chipotle chicken. The puree was the best part of this meal. Friday I had a cocktail party to attend and I can't NOT bring something, it's just not in me. I made some grapefruit glazed madeleines using the zest and juice of the grapefruit we bought this week and some ingredients from my fridge and pantry. I didn't buy anything extra from the grocery store. I don't know maybe these cost $1.50 in ingredients from my cabinet? I ate food at the party too but only a few things and, as I keep saying, I think free food is fine! The madeleines were awesome I followed this Dave Lebovitz recipe for lemon glazed madeleines, the only changes I made were (duh) using grapefruit instead of lemon and using just grapefruit juice, no water, in the glaze. Chilling the dough and mold is key, they're so much puffier and prettier then the last ones I made. I also ate three graham crackers out of the cabinet - two of them topped with peanut butter...oops. The several drinks I had at the party led to Ron and I finishing the bag of oatmeal cookies we've been munching on all week. Okay so this was the week's big cheat...you see we have a loved one in the hospital and we brought sandwiches over to the hospital for everyone who's visiting to snack on. Ron isn't so great at visualizing how much will feed how many. He got way too much and even after people grabbed some to take home there were still leftovers and they were going to go to waste. So...I ate a turkey hoagie for dinner. That's right, hoagies for dinner, oh, and some potato chips. This was the ONLY meal that we really failed on. Well, sort of, see Sunday confessions below. I know what you're asking, what the heck happened to Ron? Well, he's working in DC for the next couple of days so that means that he's not eating out of our fridge for the last day of our Cheap Eats week. But, he'll be reimbursed for his meals! So free is okay right? Well that's the gist of the week - I'll be back tomorrow to let you know what we did well and what we did not so well and what we plan to get out of all of this. Thanks to everyone that followed this week! Thanks chocolate shavings, they're no potato chips but when you want something crunchy and salty they'll certainly do the trick! 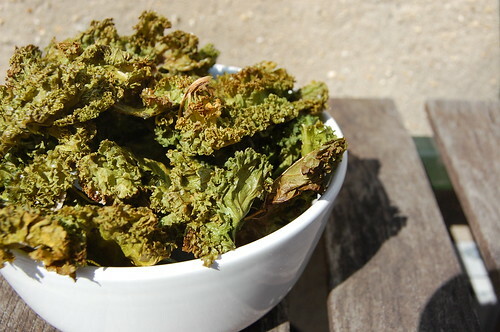 Kale chips ARE all over the blogosphere these days! This recipe seems to be the one floating around right now. I also posted one a while ago and mention it b/c I added vinegar to the mix. I've tried these with and without the vinegar--both are delicious!--but I prefer with the vinegar. Gives a little tang, brightens up the flavor. Check it out and maybe even do your own taste comparison! Four days in and going strong!